Ableton have come up trumps with this new sampler. Ideal for sound design and general use, Sampler is uniquely inspirational and fun. It should more than do for most Live users. Great value. Seamless integration with Live. Very powerful. Inspirationally easy and fun to use Imports a wide variety of sample library formats. Not ideally suited to realistic multisample instrument playback. Live users are a fiercely loyal bunch. Tell them that a major chink in Ableton´s armour has long been their lack of a serious sound designer´s sampling platform - not to mention Live´s inability to import sample formats such as Kontakt or GigaStudio - and they´re likely to debate long and hard with you. Thankfully, any such dispute has been rendered pointless with the release of Sampler, an optional add-on for Live 6. 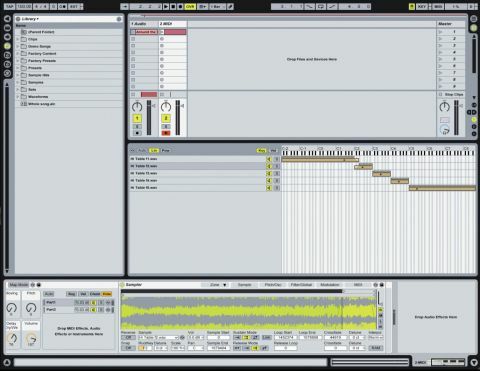 Sampler is built around the same model as the other Live plug-ins, fitting neatly into the window at the bottom of the software´s interface (though the keyzone mapping window sits above). All of its different sections are accessed via front panel tabs. Getting started is a cinch - drop a sample onto the Sample page (you can even drag ´n´ drop clips from the Session or Arrange view) and it´s automatically mapped to the root key of C3. Alternatively, you can access sample libraries in EXS, Kontakt (non-encrypted only), SoundFont, GigaStudio, S1000 and S3000 formats. Live also now has a Find Sample CD function in the browser, so you can even access many old sample library discs that your computer wouldn´t otherwise recognise. The Sample window is as simple as you´d expect, and is where you handle pitch, looping, crossfade and other standard functions. This being Live, though, they´re uncommonly easy to set up and navigate, come with some cool tools (such as bidirectional looping) and, for the most part, are real-time controllable with modulators. The next tab brings up the Pitch/ Oscillator section. This features not just a pitch envelope but also an oscillator section (with envelope) that can be assigned to perform either frequency or amplitude modulation duties, and which can itself be modulated further by the pitch envelope. All of which enables Sampler to dish up some pretty unique timbres. Next is the Filter/Global section, with a variety of filter types, including real-time morphable combinations of high-, low- and band-pass. On paper, there aren´t as many as in, say, E-MU´s Emulator X2, but many of those filters are preset combinations rather than distinctly different types. Rest assured that Sampler can certainly hold its own when it comes to depth and breadth. The penultimate section deals with modulation and includes a tasty aux envelope and three LFOs. Finally, there´s the MIDI section, where you can assign a range of MIDI CCs to one or two sample parameters simultaneously. Sitting astride all of this is the zone mapping section, and this is where the real complexity and power of Sampler becomes evident. Each multisample within a zone can have any and all of the parameters we´ve mentioned set independently for it (with the exception of the Global controls), and no other sampler makes it as easy to set up key and velocity ranges to move between them all or to solo and mute individual sections for fine-tuning. As great as Sampler is, there are a few improvements we´d like to see - compatibility with even more library formats, for one. And although it´s easy to set up the zone keymapping and multisampling section, actually creating a library of multisamples is still a highly laborious process if you´re using nothing other than Live and Sampler, so something along the lines of the Emulator X2´s automatic multisampling feature (SynthSwipe) would be very welcome. Without it, Sampler is far more useful for sound design and library playback than it is for creating original multisampled instrument patches. Similarly, it isn´t as well set up for creating highly realistic non-repetitious multisampled instrument patches as programs such as Tascam´s GigaStudio and Yellow Tools´ Independence are. Another potential criticism relates to the modulation options. Great as they are, there´s no clear reason (other than space restrictions) why the two additional LFOs can only be mapped to two simultaneous parameters each. Some users might well want to attach the same LFO to pitch, pan and filter frequency, for example. But before we start to stray too far into nitpicking territory, we should say that Sampler is another exceptional piece of code from Ableton. What´s more, when placed in the context of Live 6´s other features - like Note Length and Device Racks - it becomes arguably the most straightforward and inspirational sampler there is. If you work with any third-party sample libraries, we´d urge you to try the demo - even Kontakt and GigaStudio owners might be seduced by its power, ease-of-use and tight integration with the main Live application. Ultimately, though, we think it´ll be sound designers (both budding and pro) who´ll get the most out of Sampler, as the software makes it extraordinarily easy to get some truly unique and useful modulations on the go. Whatever your skill level, you´ll find yourself doing things you wouldn´t bother to try in any other plug-in. We´ve never used a more inspirational, fun and intuitive sampler than this.